[Notice] Prepare for a Choco Onslaught! Prepare for a Choco Onslaught! Thread: [Notice] Prepare for a Choco Onslaught! Everyone loves chocolate on Valentine’s Day, but so many people are sharing chocolate that it’s threatening to take over Maple World! NPC Cassandra is concerned about this threat and wants you to stop it by eating all the chocolate in the world. Players Lv. 61 and above can begin by accepting the quest ‘[Choco Onslaught] Enter the*Chocopocalypse’ from the event notifier on the left-side of the screen. Complete the guide quests to receive a Choco Syringe, a useful item for stuffing chocolate into your mouth. Hunt monsters within your level range (20 levels below and 20 levels above) to receive Sweetheart Choco. 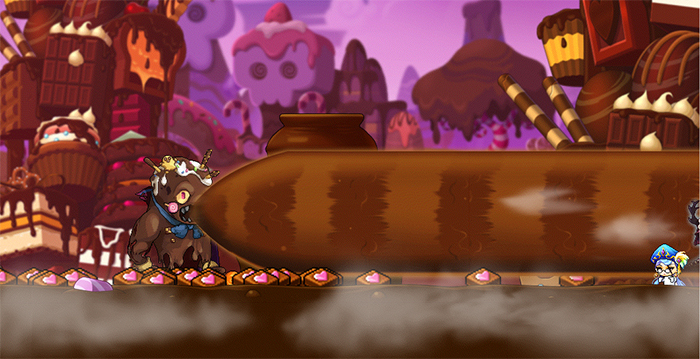 Use your Choco Syringe to consume Sweetheart Choco, which increases your Choco Power, a special buff skill. Choco Power can be increased all the way to Lv. 250 and gives different stat boosts (Speed, Jump, ATT, DEF, etc.) *for different level ranges. Cacao Combo EXP orbs also give Choco Power during the event. You can check your Choco Power level with the Choco Syringe. Choco Power resets each day at midnight UTC. Be careful, though. Eating too much chocolate at once can trigger Choco Frenzy, which will cause you to lose Choco Power and spew a small percentage of the lost chocolates. 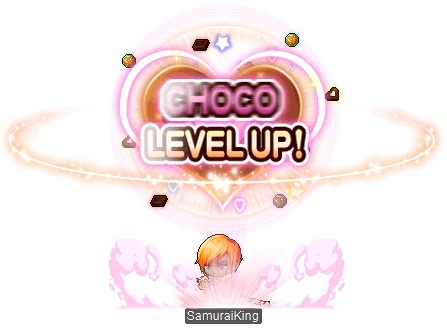 If you trigger Choco Frenzy, however, you will be able to increase your Choco Power levels at an increased rate for a limited amount of time afterwards. Because of all the chocolate in the world, the elite monsters have also become choco-crazed! Defeat Chocoholic King Slimes and Chocoholic Mushmoms to obtain the Golden Choco Tickets they drop, and then use a Golden Choco Ticket to take a trip to Choco World. When you use a Golden Choco Ticket, you will be transported to one of three special mission maps. 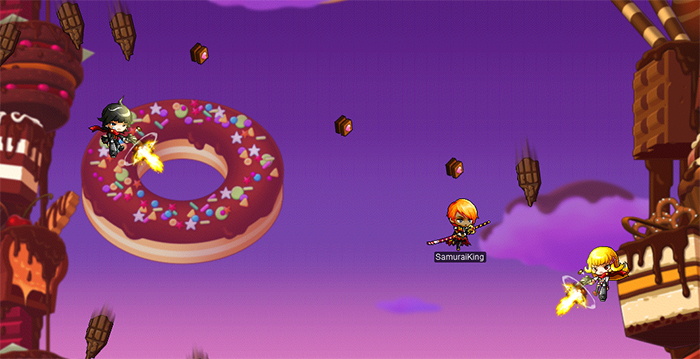 In Choco Crush, you must eliminate as many choco monsters as you can within the time limit to obtain Sweetheart Choco. 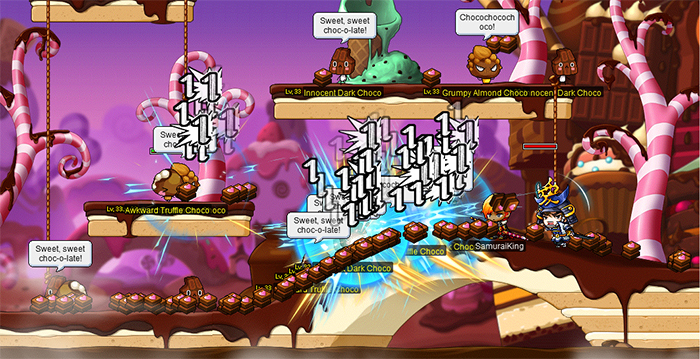 In Falling Choco, you must collect falling Sweetheart Choco while avoiding other falling obstacles. In Choco-crazed Nue, you must defeat the boss, Choco-crazed Nue, to obtain Sweetheart Choco. Beware his Choco Breath attacks! Daily Dose of Chocolate: Complete this mission and receive*Chocolate Overload Face Accessory (1 Day) Coupon*(Untradable, 1-day duration). Choco Tantrum: Complete this mission and receive*Chocolate Rain Atmospheric Effect Coupon*(Untradeable, 3-day duration). Unfair Advantage: Complete this mission and receive*Special Medal of Honor(Untradeable). Nue World Order: Complete this mission and receive 2*Golden Ticket Coupons*(Untradeable, 1-day duration). Mastering the Choco Abyss: Complete this mission and receive*Ability Circulator*(Untradeable, 7-day duration). I’ve Got a Golden Ticket: Complete this mission and receive*200*Sweetheart Reward Points Coupon*(Untradeable). Mischief Managed: Complete this mission and receive*Choco Neutralizer Implant Coupon*(Untradeable, 1-day duration). Everyday Chocophile: Complete this achievement mission and receive*Sweetheart Choco x500 Coupon*(Untradeable, 1-day duration). Drowning in Chocolate: Complete this achievement mission and receive*Clean Slate Scroll 10\%. Choc-filled Veins: Complete this achievement mission and receive*100 Spell Trace Coupon*(Untradeable, 7-day duration). Are We Human, or Are We Choco? : Complete this achievement mission and receive*2x EXP Coupon (15 min) Ticket*(Untradeable, 3-day duration). Allergic to Chocolate: Complete this achievement mission and receive*Sweetheart Choco x200 Coupon*(Untradeable, 1-day duration).